Emerging technologies are set to change the way miners operate over the next decade. Delivering improved productivity, cost savings, and safety advancements a report from the McKinsey Global Institute has identified 12 technologies that could drive economic transformations in coming years. While not all will directly impact mining, they will play a role in mining’s supporting sectors including manufacturing and health. 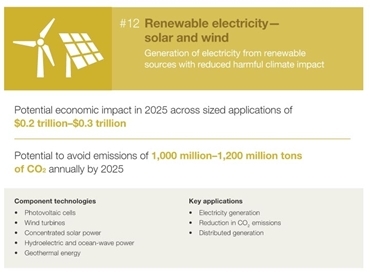 The report explains that the combined application of all 12 technologies, including advanced robotics, energy storage, and mobile internet could have a potential impact of between $14 trillion and $33 trillion a year in 2025. Topping the list is mobile internet which is expected to improve worker productivity and service delivery. Enhanced communication technology has not only improved mine site safety but transformed the way safety is managed. The roll out of the Federal Government's National Broadband Network is expected to create a wealth of opportunity for the mine sites it touches, and the increased bandwidth that comes with the NBN will enable the facilitation of increased remote mining operations. Automation in mining is set to not only improve safety but also streamline operations. Mining houses Rio Tinto and BHP Billiton have both launched remote operation centres in WA, billing the move as mining's future. Establishing networks which collect, monitor and process data will improve process optimisation. It will also allow for the the efficiency use of resources, controlling optimal water and electricity usage. Software-as-a-Service (SaaS) and cloud integration allows companies to integrate their various applications so data is entered once, saving time and creating consistency across business centres. Today's market conditions means finding operational efficiencies is more important than ever. Many mine sites around Australia are working on implementing automated machinery and processes on site, something that has been taking place for years in manufacturing. Machinery Automation and Robotics [MAR] have been working with Rio Tinto to develop the new MAR Robotic Idler Change-out which is able to replace idlers on loaded, operational conveyors. “This machine is a brainchild of people in Northparkes, this is somebody in Northparkes thinking about a better way of doing something, that gets people away that improves productivity,” Stephanie Loader Northparkes managing director said. With three kilometres of overland conveyor and 6 kilometres of conveyor belt, automating the idler change out process is set to add a large competitive and safety advantage to Northparkes’ operation. “It enables us to change out idlers without shutting down the conveyor. “Because it is a robot it gets people away from doing pretty difficult tasks,” she said. “As an added bonus we don’t have to shut down the conveyor while we’re doing this work, and we have kilometres of conveyors so this is fantastic for us. As Rio Tinto moves its 100 millionth tonne via automated trucks, it is becoming clear that automation is here to stay. And with commodity prices slumping miners are looking to squeeze every last drop out of capital expenditure budgets, forcing them to go in search of the types of operational efficiencies automation delivers.